I would like fuel consumption information for this model. The factory specs for 8.2L gas engines are 38 GPH at 25 MPH and 8.3 diesel is 18 GPH at 26 MPH. Does it really use 20 GPH more in the gas configuration? Can anyone tell me if those numbers are correct? What cruise speed do you run your boat? The 4085 Avanti is factory rated with 8.2L gas at 32 GPH at 26.3 MPH and 5.9 diesels at 29.8 GPH at 28.3 MPH. The gas engines only cost about 15% more in fuel and most of that is offset by the higher diesel fuel prices. I think their numbers are quite different considering the similarity in size. Both boats are about 43' by 13.6' and 22,000 lbs. I could not get a response from Avanti owners to confirm their numbers. I know these two boats are almost apples and oranges, but they were chosen because they fit in my boat well. I am trying to learn where the tipping point is that makes it advantageous to spend more for a diesel powered boat. Thanks. Thanks for the responses; it is difficult to learn some information. The specs I quoted come from their manufacturers. The Formula specs come from the chart that Abalmuth posted. To further support the Cummins specs, I researched the 8.3L engine on the Cummins web site. Their specs show fuel consumption of 8.2 GPH at 1800 RPM. 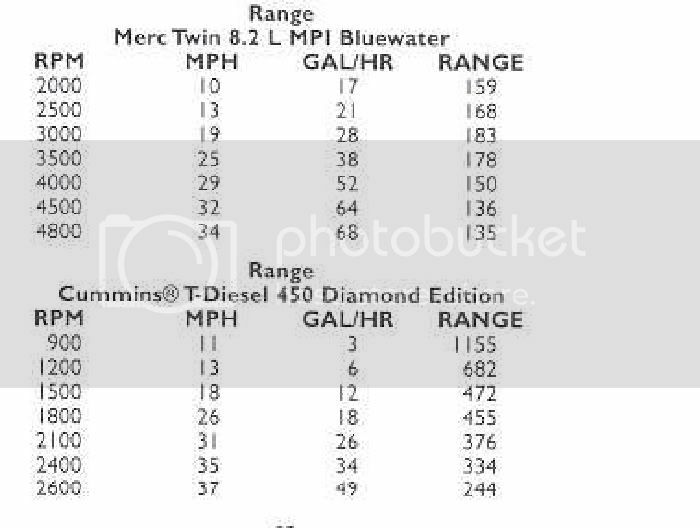 If the 8.3L truly burns 18GPH at 26MPH it is the holy grail of marine power plants. If the Formula deep V hull causes increased gasoline consumption (8.2L Avanti burns 32GPH) what explains the exceptional fuel consumption numbers for the diesel configuration (5.9L Avanti burns 29.8GPH)? I wish someone could confirm. Unfortunately boats are not like cars which I can go out and test drive everyone for sale until I find the one I like. These two models were not reviewed or tested by magazines or companies that publish boat test reports. I am hoping to learn from those who own them. I often read that Formula boat owners like the way they ride. Does that mean they ride better than other comparably sized boats? What makes them ride better? Has anyone had the opportunity to drive a different 43ft cruiser in order to compare the ride and handling to the 41PC? I cannot see enough difference in the hull shape that would explain it. The Formula is advertised as a deep V hull yet it drafts 33 inches. The Avanti without prop pockets drafts 42 inches and appears to have at about a 32 inch hull draft. The Formula's dead rise is 18 degrees verses 16 degrees for the Avanti. I do see a few differences that could be favorable for the Formula. The prop pockets improve the prop angle. The bow is narrower with a sharper entry, although this part of the bow appears to be out of the water at cruising speed. Finally, the narrow bow should shift the weight distribution slightly aft. You�re both sort of right. At 26kts the Cummins it was only about 1900RPM and 26/28 GPH for both engines. I ran the boat very often at a 2400RPM cruise at 28-30Kts with a 34-37GPH burn. Even though boats your comparing have very close spec�s you have to remember the Formula has a deeper V and needs more HP/Fuel to push it through the water. Because of this deep V I would think the Formula has less room. But the ride is incredible. 8.2L gas burning 38 GPH pushing a 41PC at 25 mph is probably quite accurate. The 18 GPH combined figure for the C-Series Cummins however, isn't right. That's PER engine, running just above 2,400 RPM, which I would expect to go more than 26 mph at that RPM - I'd expect 25-26 KNOTS. It sounds to me as though someone collecting stats confused burn for each engine with combined, and mps with knots.